1. Heat oven to 230C/fan 210C/gas 8. 2. 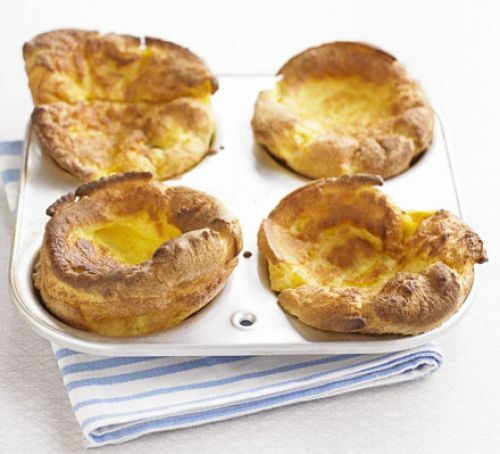 Drizzle a little sunflower oil evenly into two 4-hole Yorkshire pudding tins or a 12-hole non-stick muffin tin and place in the oven to heat through. 3. To make the batter, tip 140g plain flour into a bowl and beat in 4 eggs until smooth. 4. Gradually add 200ml milk and carry on beating until the mix is completely lump-free. Season with salt and pepper. 5. Pour the batter into a jug, then remove the hot tins from the oven. Carefully and evenly pour the batter into the holes. 6. Place the tins back in the oven and leave undisturbed for 20-25 mins until the puddings have puffed up and browned. 7. Serve immediately. You can now cool them and freeze for up to 1 month.